Diese Webseite ist ein privates Projekt, das wir in unserer Freizeit betreiben und für das wir keine direkten Einnahmen haben. Die Nachrichten zu Vulkanen, Erdbeben und anderen Themen, die Instandhaltung des Servers und dieser Webseite, sowie die frei zugägnlichen Tools zu Vulkan-Webcams und der interaktiven Erdbebenkarte aufrechtzuhalten, verschlingt enorm viel Zeit und kostet Geld. Wenn Sie die Infos mögen und uns in der Arbeit dazu unterstützen wollen, würden wir uns über eine kleine Spende sehr freuen. Vielen Dank! Sinabung (Sumatra, Indonesia): The volcano's lava dome continues to grow. Following a quieter interval, a new series of pyroclastic flows occurred yesterday. According to our correspondent Aris on location, they reached about 3 km length and associated ash plumes rose to approx. 15,000 ft (4.5 km) altitude. 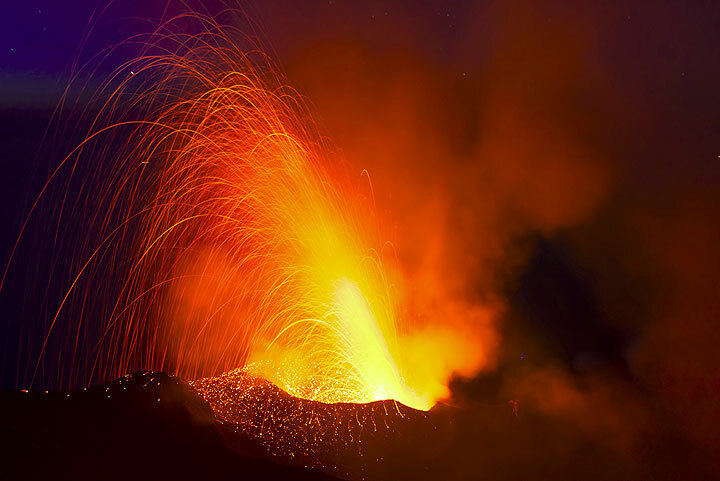 Volcanoes & Spices: This 17-days adventurous expedition is one of our most exciting volcano tours! Visit Halmahera, North Sulawesi and the Sangihe Islands with some of Indonesia's most active volcanoes, including Dukono, Ibu, Lokon, Soputan and Karangetang. Volcanoes in the Solar System: The Earth is not the only place with volcanic activity. Active volcanism also occurs at at least 3 other bodies in our Solar System. Merapi volcano photos: One of the most active and most dangerous volcanoes of Indonesia: Merapi meaning "the one who makes fire", is a feared but also venerated holy mountain looming over the city of Yogyakarta, capital of Central Java.